According to ancient Southron legends, the land of Bellakar was once verdant and lush. Vast forests covered its coastal regions, the most favored of them centered upon a mighty lake set amid the green hills. Further inland, forested highlands rose above endless expanses of grassy savanna and reed marsh. The Cuind, a tribe of Dark Elves, were first to wander the land, before the first rising of the sun, sharing its starlit trails with spirits, dwelling in caves about the wooded shores of the great lake and in sheltered vales scattered through the land. Cataclysmic deluge following the War of Wrath had repercussions throughout Middle-earth, one of which was the desiccation of Haradwaith. The vast forests of Bellakar gave way to desert. A few sizable oases remained, but only along the coasts did woodlands linger. And the Cuind are no more, except maybe their immortal spirits, which haunt the deserts. During the early Second Age, men of Harad, hunters and herdsmen from the mountains east of the great desert, established themselves along the coasts. Some taught themselves to sail the ocean in small but sturdy boats. They drew fish, squid and seal from the waters. Others found patches of good land for farm and orchard; they sustained themselves on wheat, olives, dates and grapes. Númenóreans, whose ships towered over them like the houses of the gods, first set foot on the shores of Bellakar around 1300 II. The apysaic-speaking coastal people who allowed the newcomers to live among them acquired their lore and sometimes even mixed bloodlines with them. Númenóreans taught them agriculture, and where was agricultural surplus, a new social and political order emerged, centered upon cities that grew up around the Númenórean camps. The political concept of the city-state first took shape during the early Númenórean colonization period, somewhat around 1800 II. Slowly, over many lives of Men, Númenóreans came to colonize all the coasts of Middle-earth, and ties between the coastal people and the Men of the West grew stronger. Concubinage of local women was not uncommon among the colonists, and on some rare occasions even legally recognized marriages took place. The mixed-blooded race resulting from these unions would be later indentified as the Bellakaranî nation, distinct from other nations and tribes of Harad. In each Bellakarian city-state, a council of powerful elders decided matters of law and justice. In some cities these ruling oligarchies consisted entirely of the Adûnâi, wealthy citizens of traceable and purely Númenórean descent. Among themselves they spoke only the traditional tongues of Númenor: Adûnaic and Sindarin (and later only Adûnaic). In other cities, the "mixed-blooded" class, known as the Bellakaze, held some share of wealth and power. They spoke a language as mixed as their heritage that became the speech of trade and lore all through Bellakar, even penetrating into the remote villages and desert trading stations. The era was marked by the shifting of political power from one to another of the major cities on the Bellakarian coast. The cities seem to have been ruled by governors or princes, possibly with the help of some sort of assembly of citizens. The ruler had military, judicial and religious duties. People with both Adûnaic and Bellakaze names were present from the the time of the earliest written records, and it is possible that the population may well have been mixed from the beginning. Influence of Adûnaic must have been strong from the beginning. The word âru (arru), the Adûnaic word for king, appears in a Bellakaze syllabary of the early colonization period. First Númenorean colonization effort must have occurred during the reign of Tar-Minastir (1731-1869). According to ancient syllabaric writing preserved in Hazaj Tollin, "Kiryan-Dur, Captain of the Venturers, took haven at the mouth of a river Rothlo". Second significant foundation inscription appeared at the inland oasis of Ithillond (Nîlûlôni): Númenóreans were seeking to exercise control over the emerging caravan trade westward into Bellazen. Other important settlements established by the Guild of Venturers were Ost Doranor (Ûrêzâyan) and Thorombar (Narîk-Zadan), in 1780 II according to one extant (but unreliable) inscription. Not all of the cities were ruled by Adûnai princes: Azra'm-Miraz in southern Bellazen was apparently the home of a Bellakaze dynasty from the earliest times, judging from the names of the rulers of its first dynasty as listed in the Bellakaranî King List. Also the name of the city is pronouncedly apysaic, as is in the case of Hazaj Tollin. Other cities included Korlea and Khibil Êphalak far inland. Êphalak, although regarded in Bellakarian mythology as the oldest city, originally founded by the creator god Eä when he established civilization, was never apparently the home of a ruling dynasty. Ithillond/Nîlûlôni, too, enjoyed a special status as the religious capital of the plain and traditional birthplace of the patron goddess of the Haradrim, Ladnoca, mother of gods. Each of these cities, together with its hinterland, was regarded as the home of one of the major gods of the Bellakaze pantheon. Najm, Lord of the Sea, was revered in Thorombar/Narîk-Zadan, while Ishtra, goddess of love and war, had her home at Ost Doranor/Ûrêzâyan. These patrons were expected to defend the interests of their own cities in the council of gods where all major decisions on the future of mankind were discussed. It was in this council, according to later Bellakarian mythology, that the decision was taken to flood the earth because man was becoming altogether too crafty and was disturbing the equilibrium of the gods. Najm crept out of the council, warned Nimruzîr in Romenna of the impending disaster and so enabled him to build a fleet and escape from Númenor unharmed. Under Tar-Ciryatan of Númenor, this patchwork of settlements achieved coherence through the institution of the Bellakarian League, a loose federation responsible for gathering and paying tribute for the great king. At first, Adûnai and Bellakaze alike enjoyed immunity from the tribute, which was taken from "lesser races". The city rulers of the early colonization period do not seem to have had absolute power; there are indications that there may have been assemblies of citizens which had to ratify major decisions taken by the ruler. So when Mûrathôr of Korlea wanted to go to war, he was unable to do so until he had obtained the approval of the people. There seem to have been two assemblies in Korlea at the time, and, having failed to obtain the approval of the council of elders, he then went to the council of young men, who enthusiastically endorsed his proposal (Surpassing All Other Kings: A Bellakarian epic). The earliest records suggest that land was held by families or cities rather than individuals and all male members of the family had to give their consent to a sale. Gradually, this practice ceased, and property seems to have passed into hands of private individuals. This development happened during the time of rapacious great king Tar-Atanamir, who reversed his father's decrees. A heavy tribute was now demanded of all the cities of Bellakar. Its exaction, however, was not easily effected, since several cities refused to pay, and the king had no loyal officials or garrisons in the colonies. A royal envoy was sent to Hazaj Tollin, making it clear to their lord that Tar-Atanamir was prepared to enforce his will with military might if need be. Tar-Atanamir soon perceived that he might increase his revenues still further by treating with each of the colonies of Bellakar individually, playing upon inter-city rivalries to intensify competition for royal favor. The king promised a reduction of tribute to those cities that pledged other sources of income to the Sceptre. Large parcels of land were given to his followers by the king as a reward for their services. This offer precipitated strife within and among the cities because the Adûnai ruling classes sought to shift the burden of royal finance upon the Bellakaze, while the more martially-inclined cities found pretexts to invade or plunder neighboring territories. As we have already said, early Second Age saw the shifting of political power from one city to another. The power of the city-states seems to have been largely confined to the coastlands. The start of the Tar-Atanamir period in 2029 II saw important changes in this pattern with the emergence of Ciryandur II of Emerië, a Númenórean governor of Hazaj Tollin who rose to control the whole of the coast and who then pushed as far as the Dune Sea. Soon after Tar-Atanamir's death and the accession of his son Ancalimon, Ciryandur took the title of Tar-Heruhyarmen, a manifest act of rebellion against the Line of Elros. 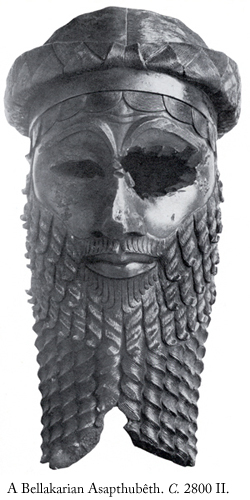 In an inscription he claimed that the God Êrû had given him "all the lands between the desert and the sea", in justified insurrection against the "tyranny of Armenelos". It seems likely that this conquest was not much more than a successful raid, but it marks the first time that a local prince claimed overlordship over all the Bellakarian cities. Ciryandur's triumph was short-lived and he was rapidly defeated by a rival. In Númenor, king Tar-Ancalimon had by now acknowledged the party of the Ârûwanâi, the "King's Men," as his favored supporters, alienating the "Faithful", who supported moderation and religious conservatism, and also the more vigorous colonial factions in Middle-earth. Many of the Ârûwanâi saw these political enemies as impure, less Dúnadan in thought and blood, than those born and living in Númenor and having their first loyalties to the monarchy. As Ciryandur probably saw it, the Line of Elros had given up any claim to rule by the Grace of the Valar and revolt against the king had become the sacred duty of all true Dúnedain. Mûrathôr, the succesful rival and founder of a new, Ârûwanâi dynasty, had appearantly begun his political career as the cup-bearer to Ar-Zaimbar, king of Azra'm-Miraz. He broke away from Azra'm-Miraz to the new city of Korlea which became the base from which he launched his campaign to subdue all the cities in the name of the Ârûwanâim. Mûrathôr was a formidable soldier and a considerable administrator. He became one of the great heroic prototypes on whom later monarchs modelled themselves and many legends and stories accumulated round his name and his story is told in the epic poem Surpassing All Other Kings, one of the few Second Age sources. This makes it more difficult to establish the true extent of his works. The War of the Renegades, in which Tar-Ancalimon put down the challenges to his sovereignty in Middle-earth, took place in 2280 II, and during that time loyal Mûrathôr and his army reached Tulwang and might have even penetrated Yellow Mountains to southern Ciryatanorë. Mûrathôr also seems to have destroyed a number of Apysani cities. He centralised the administration of the Bellakarian League, reformed the calendar, and clipped the wings of the old city-states. Korlea thus came to exercise hegemony over both the northern and southern coasts of the Bay of Tulwang, giving it exclusive control over the maritime trade routes to Bozisha-Miraz. Korlea soon became the wealthiest city of Bellakar, and its domestic territory continued to grow through colonization or forcible imposition on its neighbors. In spite of this, Mûrathôr's long reign ended in a general uprising which was eventually suppressed by his successor. Age of Korlean Regency over Bellakar was over by 2637 II, when the new Númenórean monarch Tar-Anducal in 2637 II reinstated the League of Cities (Bâitha'n-Kadîr). But though it was to be governed, like its predecessor, by an elected body of councilors called asapthubêthî (sing. asapthubêth), the organization of the new league differed significantly from the old. Executive authority over the cities (and responsibility for collecting the royal tribute) would now be held jointly by three asapthubêthî, annually elected by the combined citizenries of the league. In addition, a standing army was formed that would coexist with the militia of the individual colonies. A stele has been found in the hills of Kes Zum, commemorating councilor Inzilkhâd's leadership of the League army and his victories over the hill people and especially over Bozisha-Miraz. The attitudes and customs of the Ârûwanâi came to dominate the both Adûnai and Bellakaze peoples of Bellakar. Usage of Elvish language was officially discontinued in 2899, but in practice it must have stopped centuries earlier, since there are no inscriptions using elvish place names after 2280 II. The racial policies of Númenor caused the Bellakaze to be gradually stripped of their political power. "The lesser men" revolted against Númenórean masters many times. Most serious of these insurrections was something called the Nelegaje or "Grievance war" during the last two centuries of the Second Age, which seems to have dragged out by prolonged guerilla warfare throughout the Bellakarian hinterland. There is evidence of destruction of cities which has been attributed to the Nelegaje. In Adûnaic Chronicles the rebellion itself was blamed to Sauron and was finally crushed by prince Pharazôn in his long campaign to defend Númenórean colonies in Middle-earth. There are very few records telling us what happened in the Bellakarian League during the reigns of Tar-Palantir and Tar-Calion, and the oral histories are full of rhetorical interpolation and tall tales of marvelous wealth and incredible machines. The society was changing in a fast pace. Worship of fire and the creator god Mulkhêr came to Bellakar from Near Harad and supplanted native polytheism in several cities. Fire-worship was even made official cult in Númenor in 3300 II. 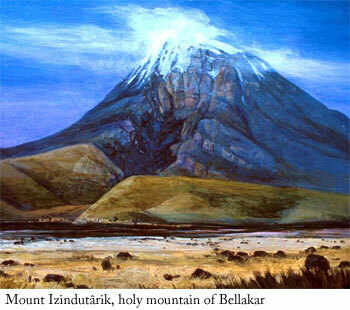 It is certain that Bellakar did not escape the cataclysmic disaster which marked the end of Númenórean rule. Korlea was destroyed in an earthquake matched to others, equally devastating, that rent the Lôkhurush and Sîres valleys, wreaking chaos in Târik an-Narduvî, Zimra-zadan and Nîlûlôni. Hazaj Tollin, Ûrêzâyan and Balkuzôr were swept away by massive tidal waves. Old social order was uprooted as disenfranchised Bellakaze masses took over the political apparatus. Two Adûnaic laments record the impact which the fall of the city of Korlea and its lords had on future generations. Political power, after a period of fragmentation and confusion, seems to have been briefly focussed to the north of Bellakar under the first king of Hazaj Tollin, Ar-Shamsar, and then, Zimrêbal Tumakveh of Nîlûlôni became the dominant figure. Both of these rulers were of Bellakaze origin. The virtual extinction of the Ârûwanâi political system makes a convenient break in the history of the area. Kingdom of Bellakar emerged when the Adûnaic League of Cities (Bâitha'n-Kadîr) was dissolved in 340 III after repeated invasions by nomadic Tedjin clans from Near Harad. Zimrêbal, a Bellakaze asapthubêth of Nîlûlôni, created his empire out of the territories of the former independent city-states. The earliest mention of the city of Nîlûlôni can be found in a tablet from the reign of Tar-Minastir, dating back to the 18rd century Second Age. It was founded by Númenóreans, but it was also known as the traditional birthplace of the Haradaic mother goddess Ladnoca, the Lady of the Moon. Bellakar adopted the writted Bellakaze language for official use, while retaining the Adûnaic language for religious use. Númenórean traditions played a major role in Bellakarian culture, and the region would remain an important cultural center, even under outside rule, throuhout the Third Age. After the Downfall of Númenor pure-blooded Adûnâi had become decisive minority in Bellakar. Many of those claiming to be Adûnâi now possessed a fair amount of Bellakaze blood. Concessions were made in Hazaj Tollin, Narîk-zadan and Nîlûlôni to allow Bellakaze to hold any office (including that of asapthubêth) in the elective league government, while reserving actual lordship over the individual cities and their militias for a select number of Númenórean families. Definitions of what qualified one as an "Adûnâ" varied according to city. But the League remained weak and most city-states were unable to mount a successful defence against external invasion. 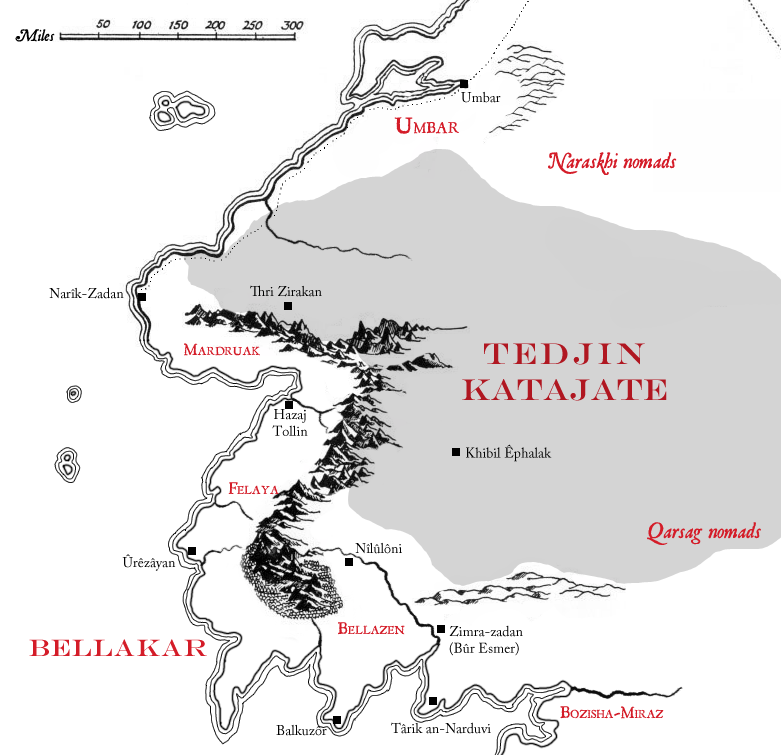 Following the collapse of the last Ârûwanâi dynasty at the hands of the Tedjin (traditional date 329 III), the Tedjin gained control over most of Bellakar, where they formed a series of katajates (from Tedjin word kataj, "king of kings"). During the first centuries of what is called the "Katajate period", the most powerful cities in Bellakar were Zimra-zadan and Balkuzôr. Zimrêbal, who had originally received his investiture to power from the Bâitha, reorganized Bellakaranî army and state, drove the Tedjin back and restored peace and prosperity throughout Bellakar. Zimrêbal was a very efficient ruler, establishing a bureucracy, with taxation and a standing army, a giving the region stability after turbulent times. In order to legitimize his dynasty, he tried to transform the religious traditions of the Bellakaranî so that they would undergrid the monarchic rule of his clan. Zimrêbal intended to exploit the religious dimension of his own city, Nîlûlôni, to its fullest in his attempt to forge a more enduring unity among the Bellakaze and Adûnaic halves of his nascent kingdom. One of Zimrêbal's first acts was to apply Bellakaze month names to the calendrical system of the King's Reckoning, enabling Bellakarian religious festivals to coincide with the cycle and rhythm of the Númenórean year. It also served as a symbolic gesture for the Bozishnara pantheon. But Zimrêbal's boldest religious innovation was to integrate Ladnoca into the monotheistic worship of Eru, thus setting indigenous cultus on a par with the Númenórean. The observance of Númenórean religion had always been dependent upon the existence of a rightful monarch, since it was believed that only the king could perform the priestly role of mediating between the people and the One. Because the line of Elros had always dwelt in Númenor in the shadow of the Meneltarma, the sole legitimate place of worship, the spiritual life of the colonists in Middle-earth had been confined mainly to observing the holy days of the liturgical calendar. Zimrêbal greatly expanded this conservative order of worship by emulating the tradition established by Elendil and his sons. Just as the Elendili had named a new hallow upon Mount Mindolluin, so too Zimrêbal chose an eminence near to his new capital of Nîlûlonde, which he named Izindutârik, the Pillar of Truth, as a fane for the worship of Eru, ascending it on the holy days to offer prayer. It was at the time of the summer equinox that Eru and Ladnoca were invoked together in thanksgiving for the first-fruits. Zimrêbal dubbed this syncretistic brand of Eru-worship the Kâthasaptha, an Adûnaic approximation of "Infinite Wisdom," the classical Bozishnara concept of cosmic order. Under Zimrêbal's auspices, Kâthasaptha came to be used as an epithet of Eru. But it never became a circumlocution for the Divine Name. Unlike the Faithful of the Westlands, the Bellakaranî were not so guarded with their evocation of the One; indeed, Eru would become a frequent element in Bellakarian names (e.g., Êruzagar "Sword of God", Êruhil "Follower of God", Êruzîr "Friend of God" and Êruzôr "Obedient to God"). But the critical nexus of cult and monarchy was encapsulated in Ûrê'n Avalê, the Day of Revival, which Zimrêbal added to the traditional cycle of festivals. This new holy day commemorated a dream visitation by Ladnoca to Zimrêbal, wherein the goddess instructed him concerning a restoration of the ancient Númenórean worship to be presided over by him and his descendants. Ladnoca had made Zimrêbal king of Bellakar. Who was he to resist the command of the goddess? The Bellakarians, like their predecessors, engaged in regular trade with city-states to the south-east; with Bellakarânî officials or troops sometimes passing to Tulwang and Bozisha-Miraz, and Apysaic merchants operating throughout Bellakar. The armies of Bellakar were well-disciplined. But its geographical position made it vulnerable to attack. Trade and culture thrived for around 150 years, until the reign of the 4th king of the first dynasty, Imruzîr, son of Belphazân. He was overthrown following the "sack of Nîlûlonde" by the Tedjin in 515 III. Young warlord Urdubâr united the kingdom three decades later and conquered Thri Zirakan, capital of the Tedjin, after a bloody six-year siege. Thri Zirakan was plundered, massacred and then renamed Zimrênzil. Urdubâr was then retroactively adopted to the First Dynasty: He claimed to be the grandson of Imruzîr, supposedly born on the back of a horse as his mother fled the flames of Nîlûlonde. But Urdubâr's ambitions went well beyond his royal predecessors' efforts to restore domestic order. The new king desired to elevate Bellakarian prestige among the survivors of Númenor: Anbalukkhôr, Khâradûnê, Zimrathâni, Umbar and, most importantly, the Pelargirean League. Since the War of the Last Alliance, the power of the Ârûwanâi along the western coastlands had fallen into decline, their bloodlines swiftly dwindling or becoming merged with the Men of Middle-earth. This development held out the prospect (or so Urdubâr hoped) of breaking down old enmities and building new ties of friendship and interstate cooperation. Confident that the descendants of the Ârûwanâi would acknowledge the sins of their forefathers, Urdubâr believed they would share hir vision of a restoration of "authentic" Númenórean tradition coupled with a harmonious embrace of native cult and custom. Bellakarian experience would become the model for survival and prosperity in a changed world, and Urdubâr would reap the glory and gratitude attendant upon it. Urdubâr's exuberant optimism met with some success. Bellakar controlled the gateway to the Bay of Tulwang, the central avenue of trade between Bozisha-Miraz and realms further south. In north his overtures had less dramatic impact. 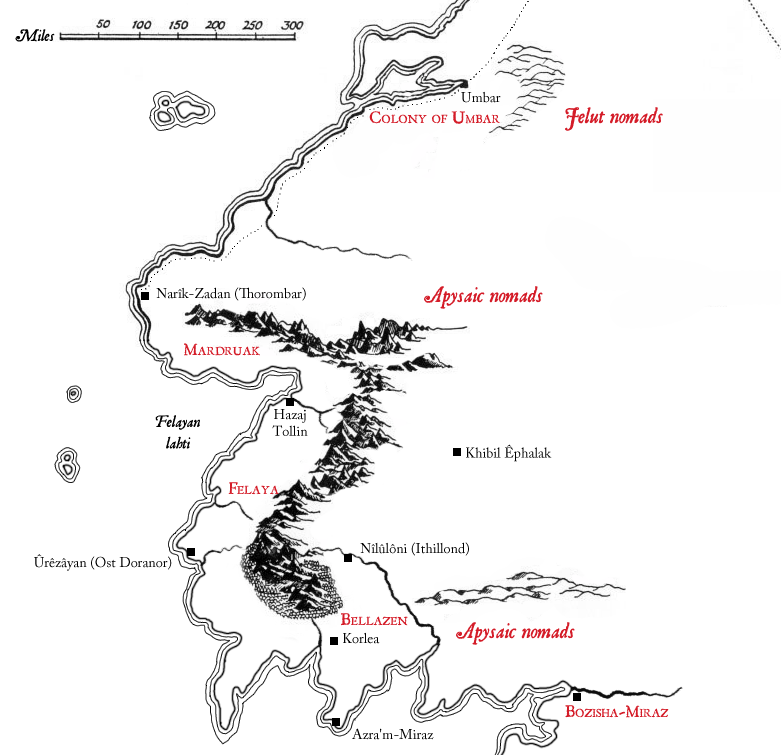 Though suffering from Tedjin disruption of inland trade, Umbar remained the strongest haven of the Ârûwanâi in Middle-earth and had powerful allies among the Haruze. Like Bellakar, Umbar had been wracked by civil war, resulting in the defeat of Mulkhêrite extremists and the destruction of their fire-temple; unlike the Bellakaranî, the underlying ideology and arrogance of the Ârûwanâi continued to be the dominant element of Umbarean society. Urdubâr's grandson, Prince Êruzôr, visited to Gondor, particularly to the Gondorian cities of the old Pelargirean league that dotted the northern coastline of Belfalas Bay: Annúlond, Lond Galen, Lond Ernil, Methir and Pelargir itself. The ships and merchants of these cities had sailed to Bellakar, and the Gondorians welcomed Bellakar's mariners as friends. Although their language and customs differed, the Faithful shared much in common with the Men of Bellakar. Both looked to the distant past of Númenor for their moral inspiration, to kings and rulers wise and honorable in deed as well as in word. The Bellakaranî had accommodated themselves to the hegemony of kings as had the Gondorians to the rule of the Line of Anárion. A preeminent ground for mutual understanding was the fact that both lived under the rule of law, rather than the fiat of tyrants or corrupt oligarchies. Both stood, at least in principle, for peaceful travel, commerce and free use of the sea-lanes of western Middle-earth. If the Gondorians were overly proud of their bloodlines, if the Bellakarians denied the peasantry a say in the rule of their realm, at least both lived in societies without slaves, where Men could walk the streets unarmed and all could speak good or ill of their day and their station in life. "There is but one fane wherein the invocation of Eru Ilúvatar may lawfully be voiced on behalf of the Dúnedain," declared Turambar, "one kingly line to whom that authority has been granted. The hallow of Mindolluin stands in the land of Gondor, not in Bellakar. By the grace of the Valar the sons of Elendil were appointed to offer prayers and supplications on behalf of the Faithful, and we have not heard that our forefathers—not even the King's Men of Ar-Pharazôn—ever dared to profane the worship of the One with Southron blasphemies. Therefore say this to your grandfather: If Urdubâr would have the friendship of Gondor, let him take counsel with himself, and remember who and what he is." The words of Turambar troubled Urdubâr and soured relations between their realms, and there was no formal alliance with Gondor, nor with Umbar.